The electricity supply company is replacing all the wooden transmission poles in our area with bushfire proof ones. This means we will be without power for the whole day for a few days over the coming weeks. For the first powerless day we planned a date day in Batemans Bay, about 30 minutes drive to the south, including a lunch of fish and chips (and potato scallops) at Innes Boatshed which, according to us and a few of our visitors, are the best in the world. We set off early for a sit in the sun and a read at South Durras in the Murramarang National Park. This is a lovely area with a small village, beautiful beaches and plenty of wildlife. Lots of winter wildflowers were in bloom and we had company also enjoying the sunshine on a warm 21 degree day. Then at midday it was onto 'the Bay'. We made it only as far as the north side of the Clyde River. 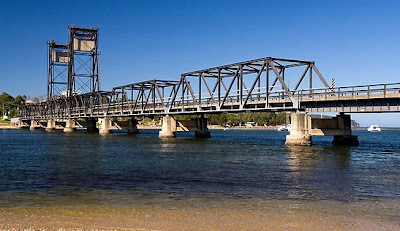 The major highway (Highway 1 which circumnavigates the entire Australian continent) crosses the Clyde into Batemans Bay via a lift bridge. It opens twice a day to let bigger boats through. Today it had opened on time, then stuck in the open position. Technicians were working feverishly to get it fixed while traffic banked up on both sides of the river. We sat for a while but it was obvious that no one knew how long it was going to take. So we turned around and headed back to our local area, had a nice lunch at Annabell's Cafe' in Milton (a usual haunt) and another sit in the sun and read at Mollymook Beach. We will try again for 'the Bay' another day. "The best laid plans of mice and men often go astray". Sounds like a lovely day. Pretty snaps!